This week from the La Crosse Tribune (La Crosse, WI) newspapers dated February 4th through the 10th, 1920. I’ve long known that Donna and the cast of “Chin Chin” played at the Metropolitan Opera House in Minneapolis from February 1st through the 7th, and played in Chippewa Falls, Wisconsin on February 11th. However, it would be unlikely that the should would go three days without a show. 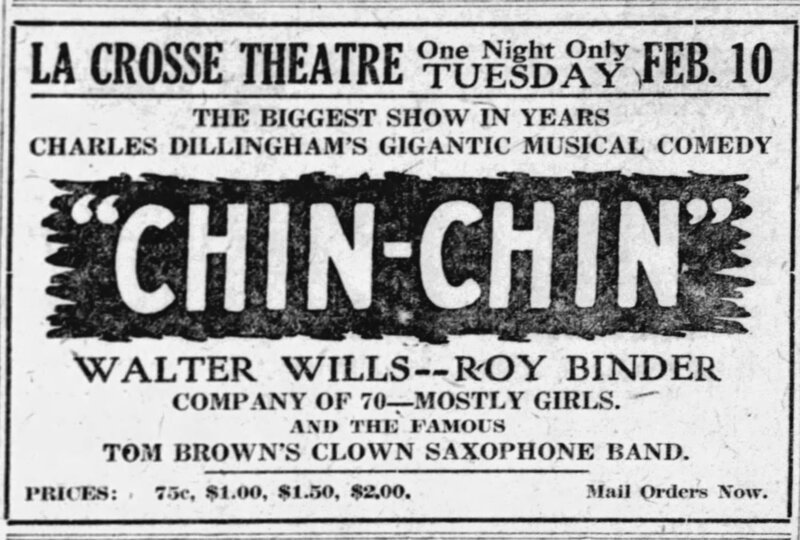 Thanks to Newspapers.Com[i], I learned this week that “Chin Chin” also played at the La Crosse Theatre, in La Crosse, Wisconsin on February 10th. Feb 8-9, 1920 – Unknown. I’m still wondering if “Chin Chin” played somewhere on the 9th. Probably. Time will tell. “Donna in the News” is my report of newly discovered newspapers articles and advertising regarding my grandmother, Madonna Montran (aka Donna Montran and aka Donna Darling). I am always excited when I find a new venue of my grandmother’s exciting show business career of the 1910s and 1920s. [i] The La Crosse Tribune (La Crosse, WI) dated 4 February 1920, Page 4, Column 5, et al. Accessed via Newspapers.Com on 10 Jan 2019. Previous Previous post: Minerva Mannin’s Parents?